At least once a week for the past 12 years we have eaten a meal at friends. Dave and I are not fussy salad eaters unless the salad has raw onions in it. I used to eat raw onions but as Dave does not like them I started leaving them out of salads. After a few years my palate became accustomed to this, and now I find raw onions to be quite overpowering. If they are blanched I will eat them, but if they are crunchy Dave will not eat them at all. These friends we go to love raw onions. She puts them into anything and everything. At lunch time if we eat there she puts a bowl of onions and tomatoes onto the table. At dinner she serves a salad of lettuce, cucumber, tomato and onions. And every time we eat there I decline to eat the salad as it has raw onions in it, and each time she asks me why I don’t eat raw onions. Some nights there will be other salads on offer, such as pickled beetroot (with raw onion), coleslaw with raw onions, potato and onion salad and even avocado and onions. So, I have started taking a salad with me when we eat there. And to make the salad more interesting, I have started using different salad dressings. I made a green salad using blanched asparagus and broccoli florets, sugar snap peas, crisp lettuce and served it with ranch dressing. I have also been making coleslaw using purple cabbage, carrots and courgettes and tossing that with my coriander and avocado dressing and Cindy’s potato salad which is boiled baby potatoes, tossed in olive oil and anchovy fillets. Last night I made a pea and bacon salad slathered with my home made mayonnaise. Do you eat raw onions? This salad dressing works perfectly with a green salad and if you are like me that means totally green vegetables. Love this post Tandy. Anthony doesn’t eat raw onion so consequently neither do I now so my tolerance has also reduced. Aren’t those friends of your funny? You think they would remember from week to week! I think she purposefully forgets! That’s so fun that you guys eat with your friends! …and really? I love raw onions in my salad! …but I can see how they would be overpowering if your not used to them! hahah… great recipe! I do eat raw onions – but not as much as your friend – if I had been having someone to a meal for 12 years and knew they didn’t eat something I would have an alternative and certainly leaving raw onions out of at least one dish won’t seem to me to be much of a problem! I agree, and it is so easy to make a separate dish of onions! Your ranch dressing sounds delicious, Tandy… I am ok with a very small amount of thinly sliced raw onions… recently we had salad at a fish and chip cafe… the salad had a soup bowl FULL of thickly sliced raw onion, which I had to pick out. And then the whole salad tastes of onion! I do eat raw onions, it’s a newer thing I’ve been doing, adding them to salads. And I love them! Red onions in particular. And they are so healthy. 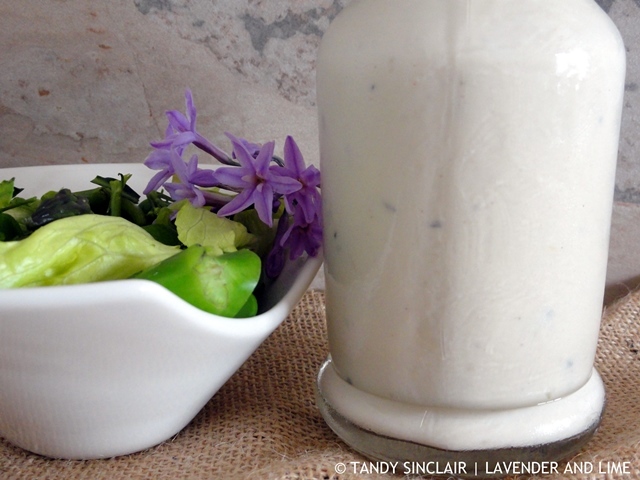 Love this ranch dressing, I have never made my own dressing and that needs to change. Homemade ranch is the best. This sounds terrific. Ranch is one of my favourite dressings. I love creamy dressing and this is also nice and liquid too. I do eat raw onions, mainly just red ones though and green ones! Never made a ranch dressing before – sounds great. I do not eat raw onions. they make my tummy hurt.